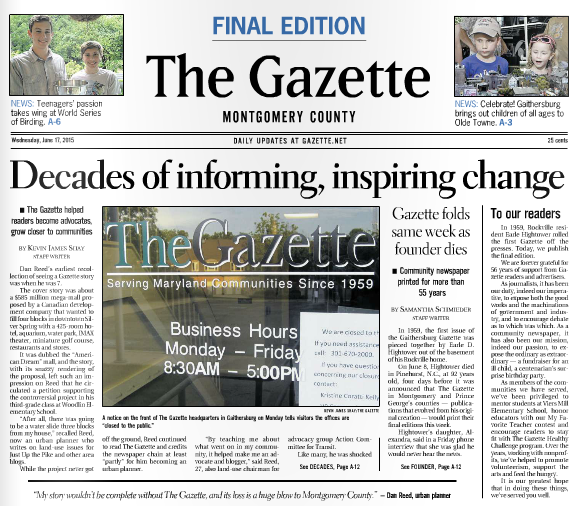 The Montgomery County Gazette newspaper will close and the final edition has been published. Post Community Media, the parent company of the Gazette, cited declining advertising revenue and inability to find a buyer to purchase the Prince George’s and Montgomery County editions. Earle Hightower established The Gazette in 1959 in the basement of his Rockville home, making it truly a hometown newspaper. Ironically, the newspaper folded the same week as Hightower, 92, passed away at his home in North Carolina. The newspaper business has increasingly become financially unsustainable, both in terms of attracting advertising dollars (which has moved from print to other media) and in gaining a foothold on the Internet. There was hope that local newspapers would be able to weather the storm because they offered something that others media could not: local content to local residents. Now the Gazette joins Patch and Rockville Central, leaving local coverage to the Washington Post, Rockville Living and the Sentinel. The Sentinel is already struggling to capture an audience and is now facing additional problems of its own making. Turns out that it published a series of cartoons over the years that that were lifted from newspapers across the country, including the Palm Beach Daily, Columbia Daily Tribune, New Yorker, and the Guardian, without attribution or payment. Now facing accusations of plagiarism and copyright violation from dozens of artists and newspapers, it’s pulled those cartoons from its website but could also be subject to lawsuits and payments that could jeopardize its future and its credibility. It is worthwhile to note two other standouts, Max van Balgooy and Virginia Onley. A Twinbrook resident and historic preservationist, van Balgooy believes it is critical to draw in residents to participate in government, especially with changing demographics. He also believes new technology should be used to effectively disseminate information. I am delighted to be considered a serious candidate by the Gazette despite my underdog status and look forward to November 3 (and I suspect their endorsement will seriously color the rest of the campaign). The Gazette, the weekly local newspaper for Rockville (and other communities in Maryland), interviewed me this morning in order to determine who they would endorse for the upcoming Mayor and Council election. I met with two editors (no reporters) in a conference room at the Gazette’s offices off Shady Grove Road for over an hour. Like good journalists, they knew the issues, asked good questions, and listened. Our conversation covered a wide range of topics, including Red Gate golf course, Town Center parking, the Rockville Pike, the development of the Shady Grove area, service on Metro, relationship between Council and city staff, Beall’s Grant II, the city budget, Victory Housing, community engagement, Town Square II, cultural diversity, affordable housing, and the relationship between the city and state and county governments. To help voters decide, they’ll be assembling a special section on their Web site that will include candidate profiles, related news stories, video statements, and more. The Gazette will announce their endorsements in late October, just before the election. Stay tuned! Anyone who knows Max van Balgooy knows he has a passion for preserving the past. 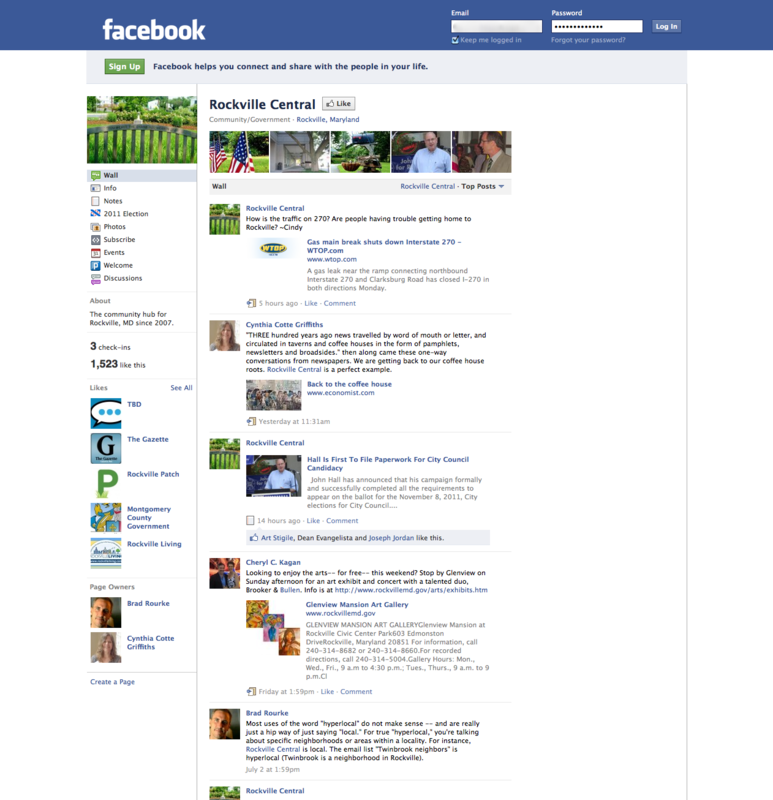 But he said it is his passion for shaping a better future that inspired him to run for Rockville City Council.